The development strategy of China Southern Airlines aims to build an international network-oriented airline with core competitiveness and sustainable profitability. With the core value of "customer first, respecting talents, striving for excellence, continuous innovation and contributing to the society", and the vision and mission of "becoming the most favorite airlines for both customers and employees, China Southern Airlines endeavors to create the best Chinese service brand leading the Asian market. China Southern Airlines went public on both New York and Hong Kong Stock Exchanges in 1997 and listed in China's mainland in 2003. At present, China Southern Air Holding Company has 8 member enterprises including China Southern Airlines Co., Ltd, pilot training academies in Beijing and Australia, and a flight simulator training center and an aviation engine overhaul center in Zhuhai. 'China Southern Airlines Co., Ltd., a proud member of SkyTeam, is directly affiliated with China Southern Air Holding Company, specializing in air transportation services. With headquarters based in Guangzhou, China Southern Airlines’ company logo can be seen around the globe with a brilliant red kapok delicately adoring a blue vertical tail fin.China Southern has 15 branches including: Xinjiang, Northern, Beijing, Shenzhen, Hainan, Heilongjiang, Jilin, Dalian, Henan, Hubei, Hunan, Guangxi, Zhuhai Helicopter, Xi’an and Taiwan; and five holding subsidiaries: Xiamen Airlines, Shantou Airlines, Guizhou Airlines, Zhuhai Airlines and Chongqing Airlines China Southern has bases in Shanghai, Daqing and Shenyang; 22 domestic sales offices located in major Chinese cities including Shanghai, Beijing and Shenzhen and 56 worldwide sales offices located in New York City, Los Angeles, Paris, Tokyo, Amsterdam, Dubai, Sydney, Vancouver, London and Seoul. Currently, China Southern operates more than 460 passenger and cargo transport aircraft, including Boeing 777, 747, 757 & 737 and Airbus A380, 330, 321, 320, 319. The airline fleet is ranked among the world’s top six airlines (in terms of fleet size) and with Guangzhou and Beijing as its central hubs, the carrier boasts a substantial route network spanning more than 150 destinations in China and more than 40 destinations in Asia with service to Europe, America, Australia and Africa. China Southern has more than 1,930 daily flights to 175 destinations in 34 countries and regions across the world. Through close cooperation with its SkyTeam partner airlines, China Southern’ global route network spans 983 destinations to 178 countries and regions and nearly every major world metropolis. China Southern transported more than 80 million passengers in 2011, ranking the carrier first in Asia (and third in the world) and topping all Chinese airlines for 33 consecutive years. China Southern is the sole Asian airline ranked in the world’s top five passenger carriers as well as the only Chinese airline listed in the world’s top 10 in civil aviation for seven consecutive years. By December, 2011, China Southern accumulated nearly nine million hours of safe flight operations and carried close to 600 million passengers without incident. 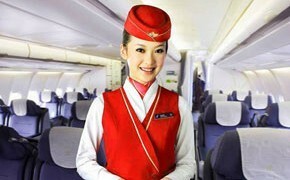 The airline’s safety commitment has - and continues to be - unwavering both throughout China and globally. On July 16, 2008, China Southern was honored with the Five-Star Flight Safety Award by the Civil Aviation Administration of China (CAAC), becoming the leading Chinese carrier to maintain the highest safety records in China.